Dr. Mitzi Westra, mezzo-soprano, received her B.A. degree in music and religion from Augustana College in Sioux Falls, South Dakota. Her graduate work was done at the University of Minnesota in Minneapolis, where she received her M.M. and D.M.A. in vocal performance, working with such nationally renowned artists as coach/accompanist Margo Garrett and opera directors James Robinson and Vern Sutton. She was frequently seen on stage in roles such as Orlofsky in Die Fledermaus, Zita in Gianni Schicchi, Florence Pike in Albert Herring, Amastre in Xerxes, and Cherubino in The Marriage of Figaro. In 1993 she portrayed Ma Moss in the touring production of The Tender Land. 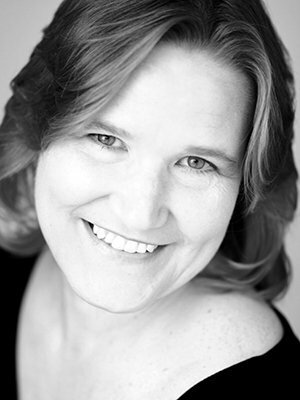 While in Minneapolis, she spent 4 years performing, touring, and recording with a professional choral group, the Dale Warland Singers, and was alto section leader for the DWS Chamber Singers. She then moved to Beaumont, Texas, and taught private voice, diction, and music theory at Lamar University. While there, she played the roles of Lalume in Kismet and Lady Larkin in Once Upon a Mattress, as well as performing frequently with the Symphony of Southeast Texas. Since moving to Indianapolis, she has appeared as soloist with Indianapolis Chamber Orchestra, Indianapolis Baroque Orchestra, New Century String Quartet, and the Grammy Award-winning Pacifica Quartet, as well as performing frequently on the University of Indianapolis Faculty Artist Series. Recent opera performances include Katisha in The Mikado and the mother in Amahl and the Night Visitors. As an avid choral musician, she has also sung with Indianapolis Symphonic Choir and Chamber Singers, Meridian Vocal Consort, Beecher Singers at Second Presbyterian Church, and Mon Choeur, the resident vocal chamber ensemble at University of Indianapolis. Summers are spent in Santa Fe, New Mexico, where she sings with The Santa Fe Desert Chorale, a professional choral ensemble. She currently teaches in the vocal department at University of Indianapolis, as well as being an alto section leader at Second Presbyterian Church, recording for Aireborn Studios in Zionsville, and maintaining her own private studio. She is pleased to be married to Frank Felice, composer and professor at Butler University in Indianapolis (www.frank-felice.com).